! Not wanting to make any unnecessary runs to the grocery store, I did what I often do and consulted several recipes and then substituted some items with things I already had. Abracadabra, my inner gazpacho emerged triumphant. This recipe owes much to several cold soup and gazpacho recipes in the New Basics Cookbook (my go-to cookbook for going on 20 years now and it’s never let me down!) 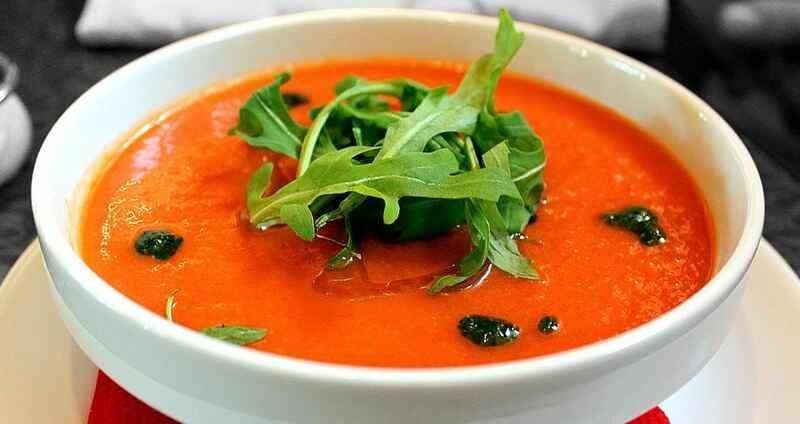 As you can see, making gazpacho is a bit like making and salad along with your own dressing and then blending it all together in a chilled soup. I did away with the eggs and yogurt some recipes call for as I was sure the avocados would smooth it all out. Combine the olive oil, vinegar, miso, dill, basil, lime juice and salt in a bowl and stir to combine. Set aside. Coursely chop the cucumbers, zucchini, avocados, peppers, and onion and place them in a food processer (this will have to be done in at least 2 batches). Pour 1/2 of the olive oil mixture (or less) in and process until only small chunks remain. Process all the veggies to the same consistency and then pour it all into a large bowl. If you want to eat it quickly, throw in several ice cubes and place the bowl in your freezer. It should be nicely chilled this way in about 15 minutes. When you take it out, stir in or spoon out any ice cubes that haven’t melted.